Three crewmen were brought to shore safely after their 20-metre beam trawler was forced on to the rocks in a gale on Sunday night. The volunteer lifeboat crew from Kinsale RNLI answered a call from the Sean Anthony and launched at 6.10pm, arriving at the scene within five minutes. 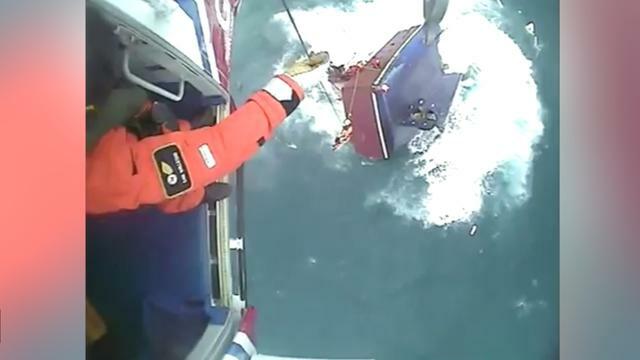 They found the vessel on the rocks with three-metre high waves breaking over its deck and dropped anchor nearby as the stricken boat was rocked back and forth. The three crewmen then jumped into the sea one by one under the guidance of the rescue crew and were pulled to safety on board the lifeboat. The fishermen lost all their personal belongings and RNLI volunteers issued an appeal to the local community in Kinsale for clothing and shoes for the men. The station also received several offers of accommodation. Watch the dramatic rescue unfold.